Eldorado Feather Reed Grass forms a clump of medium green leaves that are topped with green seed heads that turn to tan in late summer and last through early fall. They appear as wheat colored spikes and make a great cut flower. Clumps are easily divided in the spring. Eldorado Feather Reed Grass will grow to a height of 18" to 24" tall and just as wide. 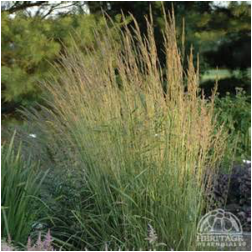 Eldorado Feather Reed Grass likes to be planted in full sun and moist, well drained soil. It will become drought tolerant once it is established. This grass is deer resistant.